"Conservation and Restoration of 11 Natura 2000 Riparian and Wetland Habitats in 10 SCI's in Bulgarian Forests"
Bulgaria has limited experience in management and restoration of riverine and wetland habitats. The project goal was to improve the conservation status of 10 Sites of Community Importance (Natura 2000 sites), managed by the Executive Forestry Agency (EFA) through conservation and restoration of 11 riparian and wetland habitats in forests. The 10 project sites are also nature parks under the national protected areas legislation. The target alien species for removal were the Black Locust in Lomovete and Zlatni Pyasatsi (30.6 ha), Indigo Bush in Persina (27 ha) and Japanese Knotweed in Bulgarka (12.2 ha). Traditional methods used for removal of Black Locust and Indigo Bush were used by cutting and/ or heavy machines, ploughing, then planting the saplings of local tree species followed by cultivation for 3 consecutive years. Their removal made space for the following habitat restoration. 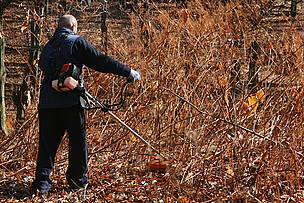 A Japanese method for removal was tested for the removal of the Japanese Knotweed including 24 mowing on the same area annually, which has stopped the distribution of the plant up the stream of the Sivyak River in the Bulgarka site. The most extensive work in terms of time and resources was the restoration of 4 forest habitat types (91E0*, 9180*, 92D0*, 91F0) in 7 sites through planting of typical tress species. The sites are Bulgarka, Vitosha, Vrachanski Balkan, Zlatni Pyasatsi, Persina, Lomovete and Sinite Kamani. The composition of species varied from park to park, but generally the species were: Black Alder, White Willow, Common Ash, Black Poplar, European White Elm, Pedunculate Oak (91E0), Beech, Sessile Oak, Silver Lime, Sycamore, Turkey oak, Field Elm (9180*), Dwarf Mountain Pine (92D0*) Caucasian Ash (91F0). Restoration took place on a total area of 80.6 ha. In Strandzha the Saarland method is aimed at longterm conservation and enhancement of the forest ecological functions, while the interventions allow for the production of high quality expensive wood and fewer expenses compared to currently used conventional methods. Its main tasks are biodiversity conservation, giving priority to natural regeneration and to local species, the use of natural succession processes taking place in the ecosystem. The method was applied on a total area of 144.1 ha targeting habitats 91S0*. 13 rare and protected plant species were restored in 4 sites as elements of the target habitat types. These were White Waterlily, Yellow Waterlily, Water Chestnut, European Waterclover, Water Soldier for Persina (habitat 3150); Pancic’s Angelica, Rubarp (habitat 6430) , Rila Primrose (habitat 7140) for Rilski Manastir; common sundew and buckbean (habitat 7140) for Vitosha; common yew, Caucasian Whortleberry and Black Sea Holly (habitat 91S0) for Strandzha. This action achieved two types of results – on the one hand strengthening populations of rare plants and on the other hand – improved structure of the target habitat types. The highlights in this conservation action include the return of the Buckbean in Vitosha after being extinct from the site for decades; the establishment of the second locality in the country of the Water Soldier; production for the first time of Caucasian Whortleberry and Black Sea Holly under controlled conditions – this is a purely pilot action as there was no prior experience of working with these two species. Another important conservation action was the protection of 11 target habitats through specialised infrastructure. Damage and degradation was prevented by constructing specialized infrastructure or adapting the existing one on a total area of 303.9 ha. The impact of specialized infrastructure is three types: (1) with direct impact – facilities providing direct protection, (2) with indirect impact – concentrating the tourist flow and (3) indirect educational. The infrastructure includes: 1795,32 m of constructed wooden fences, 621,9 m of constructed wooden grates on the tourist tracks, 28 new wooden bridges and 13 reconstructed ones, 32 new and 11 refurbished tourist rest and information spots, 24 stone fireplaces, 17 rehabilitated fountains, 149 information and 269 redirection boards placed on site, 245 signs, 40 prohibition signs. 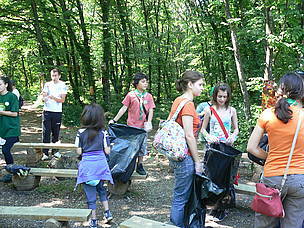 Clean – up activities included the organisation of one-day event “Clean-up Nature Park Day” with volunteer work in parks in three consecutive years and professional cleaning with heavy machines. Total area of natural habitat types cleaned is 447.9 ha. In addition 10 waste management info boards were placed in each of the 10 parks in 2011. A number of activities were implemented to involve and educate stakeholders, activities for communication and dissemination of project work and results. Training events and meeting with state and private forest managers were organised on the topic of sustainable forest management compatible with biodiversity conservation. Regional meetings with stakeholders were organised by every nature park administration to present project work to gain support and raise awareness on Natura 2000 and nature conservation. A travelling exhibition presenting the project activities, progress and the values of Natura 2000, was produced and visited 10 towns in the country and was exhibited in key locations in the capital Sofia including the Sofia airport during the holiday season when 195 000 passengers, potential viewers, passed. 3 trips were organised for journalists in Bulgarka, Strandzha and Vitosha to present activities which received coverage on national television. For a specialised audience the lessons learned were presented in a brochure distributed among foresters, biologists, students. The same information was presented in a multimedia presentation. Both products are accessible on-line and were distributed to professionals. For the wider public were prepared: a Layman’s report, 9 short flash presentations on various activities of the project. 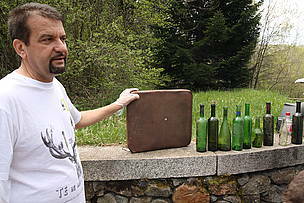 Removal of alien species in Rusenski Lom Nature Park. Cultivation of young forests under the Saarland method in Strandzha Nature Park. Collection of Yellow Water Lilies in Persina Nature Park. 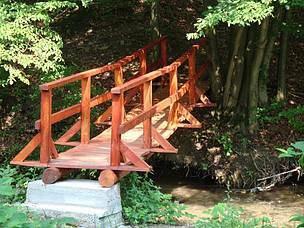 Bridge constructed in Bulgarka Nature Park in 2010. 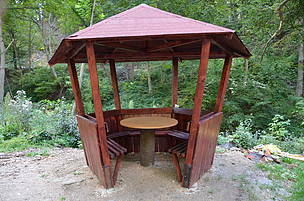 Alcove constructed in Bulgarka Nature Park in 2012. 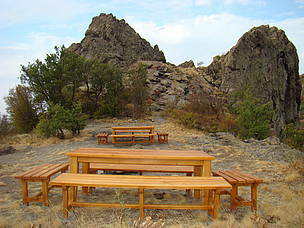 Wooden benches constructed in Sinite Kamuni Nature Park in 2012. The project is into its fourth year of implementation. All preparatory actions are completed: specific locations for afforestation and restoration of rare plants are selected, technological plans for removal of alien species and for afforestation are completed and agreed with the Regional Inspectorates on the Environment. Programmes for restoration of 13 plant species are developed: White and Yellow Water Lily, Water Chestnut, European Waterclover and Water Soldier (for Persina site), Round-Leaved Sundew and Buckbean (for Vitosha site), Strandzha Blueberry, Black Sea Holly and European Yew (for Strandzha) and Angelica pancicii, Rhubarb and Rila Primrose and European Yew (for Rila Monastery). All programmes are agreed with the Ministry of the Environment and Water. 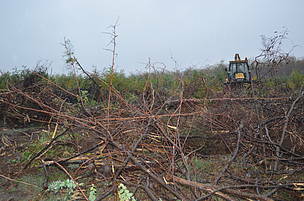 All conservation actions are in progress: Alien species (Robinia pseudoacacia, Amorpha fruticosa and Reynoutria japonica) have been removed from 4 sites on a total area of 43.48 ha. The main conservation action (both in terms of funds and in terms of amount of work) is Action C1.3. Restoration of habitats by planting seeds and saplings/cuttings of local tree and shrub species. Maintenance over 1st year. It is well ahead in all 6 sites, where this action is planned to take place. In total 64,6 ha from all the planned 80.6 ha are already planted, and 71,3 ha of young forests cultivated under the Saarland method in Strandzha. From all the 13 plant species planned for restoration under Action C2, 11 have already had their first planting in the field in 4 of the sites. Young plants from 2 species are still under production in nurseries. White and Yellow Water Lily, Water Chestnut, European Waterclover and Water Soldier have all been planted in the marshes on the Belene Island in Persina Nature Park. The highlight is the Water Soldier (Stratiotes aloeides), which not only survived after being placed in the Trapa on the Belene Island, but also proliferated successfully, which is the first such restoration of the species in the country. Young specimens of Round-Leaved Sundew and Buckbean were all planted in Vitosha NP, with the Buckbean returning to the park after decades it has been considered as extinct by the experts. Angelica pancicii, Rhubarb and Rila Primrose and European Yew have been planted in the Rila Monastery Nature Park. And Common Yew saplings have been planted in Strandzha. Under Action C.3: Protection of the target habitats through specialized infrastructure, a various park infrastructure was placed in all 10 parks: 17 new tourist rest and information spots were constructed and 7 refurbished, as well as 1 new tourist route, 2 tourist routes reconstructed as well in the 10 sites as well as 25 new small wooden bridges and 10 reconstructed ones; and 123 information boards, 246 redirection boards, 245 signs, and 70 prohibiting signs, 735 m. fences and 318,09 m. wooden grates. Three National Clean-up Parks Day were carried out every year of the project under Action C.4: Removal of anthropogenic waste from the target habitats, where 8400 volunteers collected 36 tons of waste from the nature parks. The trend is for increasing the number of volunteers and reducing the number of waste. Communication actions are under way as well, with web site maintenance, training of forest owners, press work, celebration of the 20th anniversary of the LIFE+ Programme and the Habitats Directive. The highlight of the communication work is the travelling exhibition, which shows from the air pictures from the 1ten parks, as well as illustration and information from project activities. Research of the places for restoration - the places where restoration of forest habitats will take place have been selected. 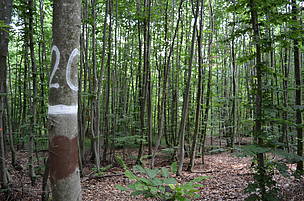 Technological afforestation plans for the sites Lomovete, Persina, Bulgarka, Vrachanski Balkan, Sinite Kamani, Zlatni Piasatzi and Vitosha are prepared. In Strandzha it is envisaged that the habitats conservation will be carried out using the Saarland method. All technological plans are agreed with the relevant Regional Inspectorates of Environment and Waters (RIEW) in line with the Regulation on appropriate assessment of the compatibility of plans and projects with Natura 2000 sites. The methodologies for restoration of thirteen plant species are developed: White and Yellow Water Lily, Water Chestnut, European Waterclover and Water Soldier (for Persina site), Round-Leaved Sundew and Buckbean (for Vitosha site), Strandzha Blueberry, Black Sea Holly and European Yew (for Strandzha) and Angelica pancicii, Rhubarb and Rila Primrose and European Yew (for Rila Monastery). The programmes for 9 of these species, from which reproductive material is planned to be collected, are approved. Additional information is available here. The first tendering procedures for afforestation according to Public Procurement Act were announced (Nikopol and State Hunting Enterprise Danube-Ruse). 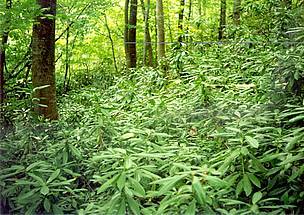 The locations for collecting reproductive material – seeds and cuttings from for the restoration of forest habitats were selected. Seeds and cuttings of 10 species are collected. Additional information could be found here. 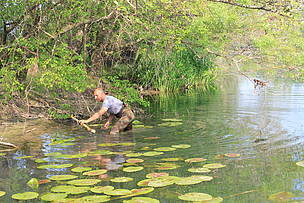 A joint team of WWF and Persina Nature Park works on the restoration of water lily in the ponds on the Island of Persin in the Danube River. In May this year rhizomes of yellow lilies of Veleka were planted in the Peschinsko Marsh and in one of the channels on the Belene Island. More information could be found here. Nearly 90 000 trees were planted during the spring afforestation in four nature parks: Vrachanski Balkan, Bulgarka, Sinite Kamani and Vitosha. They are all local species. This year saplings of black poplar and white willow were planted on an area of 23 daa in Vrachanski Balkan Nature Park within Mezdra State Forestry Enterprise. The saplings were provided by Pazardzhik Poplar Station. The planting with these species aims to restore the riparian forests in the region. By the end of the year three cultivations are forthcoming to provide a higher percentage of saplings survival. Next year another saplings of black alder will be planted. On a total area of 106 daa in Bulgarka Nature Park 53 800 saplings of the species black alder, willow and mountain ash were planted. The aim is restoration of riparian forests. To restore the forests on the slopes beech, sessile oak, sycamore and silver lime were used. In the recent two weeks, the first cultivation of new plantations was carried out; two more are foreseen by the end of this year. 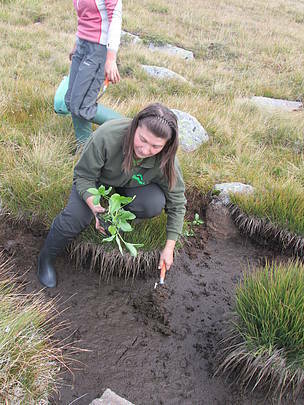 Within the project, in Sinite Kamani Nature Park, on an area of three daa, near Asenovets dam white willows were planted. The aim is to restore a riparian habitat, typical for rivers and wetlands in southern Bulgaria. Moreover, in the Daulite area, 16 daa were planted with maple and beech trees this year. Cultivation should be carried out three times this year - in June, July and September;the first two had been realized till now. On an area of approximately 100 daa in Vitosha Nature Park saplings of dwarf pine have been planted. Forestry activities are conducted on the south side of the park in the land belonging to Chuipetlovo village. The aim is to restore the so called bog woodlands. In the autumn of the last year in the same area saplings of white willow, which are part of riparian forests in southern Bulgaria, were planted. On May 29th 2010, May 4th 2011 and June 19th 2012 over 8000 volunteers took a part in the National Nature Parks Day – an initiative of WWF supported by Globul and national parks administrations. The volunteers gathered eight tons of waste. As part of the infrastructure project 11 wooden bridges in 9 parks were built, as well as over 10 tourist corners. The existing infrastructure such as shelters, tourist spots, benches and more was renovated. In each of the 10 parks ten boards with information about waste collection in the nature were placed as well as information boards for the project. An Internet page of the project is developed. It is updated with project news and results on a regular basis. The first press conference of the project has been organized as well as the first media trip (at Bulgarka). During the trip a detailed information and demonstration of the project activities was presented to the media. Press information is provided both to national and regional media on regular basis. The management team of the project is formed, the documentation for the inclusion of 21 new beneficiaries was prepared and a new agreement between The Executive Forest Agency (EFA) and The European Commission was signed. 21 agreements between the coordinating beneficiary and the new associated beneficiaries were prepared and signed. The first inception report was prepared and submitted to the Life Unit and a letter with comments and recommendations for the progress was received. The first meeting of the whole project team was held as well as a series of internal meetings with fewer members. Visits to project beneficiaries related to project administration problems as well as field visits are under implementation. A Steering Committee for the project was established. It carried out its first meeting at November 26, 2010 with the participation Representatives from Ministry of Environment and Waters (MOEW), The Executive Environment Agency (EEA), The Forest Research Institute and The Institute of Biodiversity and Ecosystem Research to The Bulgarian Academy of Sciences, The Bulgarian Society for the Protection of Birds and The Bulgarian Biodiversity Foundation took part. 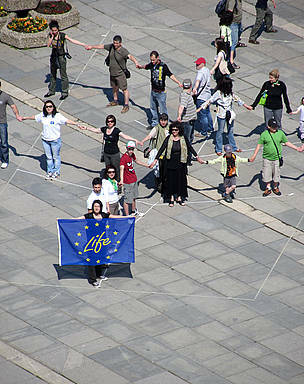 Three meetings with the monitoring representative of the Life Unit were held: in April 2010, May 2011 and May 2012. The first season of the aerial photographing of parks was completed at 2011. It was performed by the popular photographer Alexander Ivanov. Now he is works on the second season. The financial audit of the expenditure documents for 2011 finished, notes of the auditors are received. Within the framework of this initiative 11 wooden bridges in 9 parks were constructed and existing infrastructure - shelters, tourist spots, benches, have been repaired. In each of the ten parks ten boards with information about the problems of waste in nature were placed as well as two project information boards. Technological afforestation plans for the sites Lomovete (State Hunting Enterprise (SHE) Danube - Russe, Persina (State Forestry Enterprise (SFE) Nikopol), Bulgarka (SFE Gabrovo), Vrachanski Balkan (SFE Mezdra), Sinite Kamani (SFE Sliven), Zlatni Piasatzi (SFE Varna) and Vitosha (GHE Vitoshko - Studena) are prepared. In Strandzha it is envisaged that the habitats conservation will be carried out using the Saarland method (SHE Gramatikovo and SFE Kosti). All of the technological plans are agreed with the relevant Regional Inspectorates of Environment and Waters (RIEW) in line with the Regulation on appropriate assessment of the compatibility of plans and projects with Natura 2000 sites. The methodologies for restoration of thirteen plant species are developed: White and Yellow Water Lily, Water Chestnut, European Waterclover and Water Soldier (for Persina site), Round-Leaved Sundew and Buckbean (for Vitosha site), Strandzha Blueberry, Black Sea Holly and European Yew (for Strandzha) and Angelica pancicii, Rhubarb and Rila Primrose and European Yew (for Rila Monastery). The programmes for 9 of these species, from which reproductive material is planned to be collected, are approved. The first inception report was prepared and submitted to the Life Unit and a letter with comments and recommendations for the progress was received. The first meeting of the whole project team was held as well as a series of internal meetings with fewer members. Five visits to project beneficiaries related to project administration problems as well as field visits were held. The Forest Research Institute and The Institute of Biodiversity and Ecosystem Research to The Bulgarian Academy of Sciences, The Bulgarian Society for the Protection of Birds and The Bulgarian Biodiversity Foundation took part. Two meetings with the monitoring representative of the Life Unit – in April 2010 and in May 2011 and letters from the Life Unit with comments for the progress were received as a result. Contract for aerial photographing of parks, which will be realized by photographer Alexander Ivanov, is signed and the first 5 pars are already filmed. The financial audit of the expenditure documents for 2010 finished, notes of the auditors are received. A project internet web page has been developed, and kept updated with news and results from the project. The first National Press conference for the project was held and a journalists trip was organized in Bulgarka site. During the trip the project activities were presented and it was shown how the alien invasive species Japanese Knotweed will be removed.